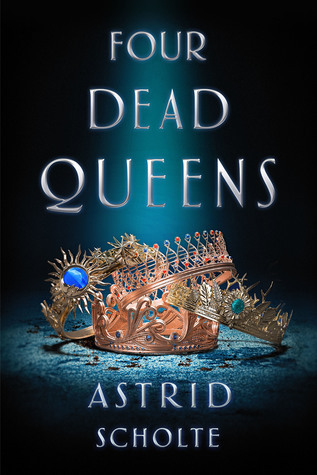 I received an ARC of Four Dead Queens by Astrid Scholte at San Diego Comic-con last summer. I was cautiously optimistic since YA and royals don’t always mix well for me. Sadly, I did not end up enjoying this one and I want to talk about the reasons why, because they are things that always throw me off in books. While things are eventually explained (in the last 75 pages), my overall feeling toward this book is confusion. In the opening chapters, you meet Keralie, a girl living off the streets as a pickpocket, or ‘Dipper’. She works for a guy named Mackiel, a childhood friend and the leader of the Dippers. As you learn in the synopsis, she quickly gets entangled in a murder mystery surrounding the 4 dead queens of Quadara. Opposite Keralie’s chapters, you have POV chapters from all of the queens. All told, this book uses 6 different POVs. Knowing that the queens were (supposedly?) dead made the queens POV chapters feel moot. I didn’t want to invest in them as characters because I assumed they were going to die. It’s not even a spoiler to say they died, it’s in the title! I wound up rushing through these chapters just to see their death scenes which felt…gross. Maybe this is influenced by A Game of Thrones. So much of the buzz for that series comes from character deaths. Maybe the idea was to alert readers to the fact that deaths were coming to draw them in. That just feels counterintuitive to building character to me. Why even include the queens POVs? One POV doesn’t even show up until the last 100 pages, and I found it impossible to take an interest in them. The plotting in Four Dead Queens is a bit of a mess. Though it’s meant to contribute to the “mystery” of the story, the timeline is not linear. The jumps back and forth in time just felt needlessly confusing. At one point, the book takes 50 pages to catch up with itself, and from that point forward the story IS linear. It was very odd to me. Aside from my issues with character and plot, it seemed like the book was trying to say something interesting about gentrification and globalization. The Queendom of Quadara is divided into 4 sections (Quadrants…). Everything revolves around the continued division of those sections. You are only permitted to visit neighbouring quadrants under very specific conditions. Moving between quadrants doesn’t happen often. This is described as a means to preserve the culture of each quadrant. That might be believable if the queens of Quadara weren’t all forced to live together in one palace, and never leave throughout the terms of their reign. Their people are forced to live divided, which the queens are forced to live together. This arrangement will almost inevitably lead to misgivings about the division of the Queendom. Even though the queens live and rule under one roof, they governed their quadrants separately. One quadrant engages in euthanasia on a daily basis to cull their population, and none of the queens does anything to stop it! They have to allow it because it’s part of the “culture”. It’s was all very odd to me, and unnecessarily complicated. Going back to that quadrant that practices scheduled euthanasia, Eonia. Eonia is the most technologically advanced of all the quadrants. However, their technology confused me. Chips that record memories are at the forefront of this story. After a memory is recorded, the chip can be used exactly one time before it is useless. This was such a huge plot device it hurt. This was one of many little things that added up to a lot of annoyance for me. At one point, Keralie is able to move through a heavily guarded palace unnoticed and steal a custom outfit from one of the queens, which no one notices she’s wearing somehow? Lot’s of little inconsistencies like this are never fun for me as a reader. The last big thing I want to talk about is the murder mystery. This was perhaps the element of the book I was most excited for, and it really fell flat. It’s a case of not having all the information required to make an educated guess. The book has to tell you the answer. Even so, I did end up figuring it out before the reveal, but I hoped my guess was too outlandish to be accurate. It makes me feel like the book doesn’t want me to figure out the mystery, or assumes I couldn’t figure it out. All of this to say, this is not a book I would recommend, and I would love to see less of these issues in my reading this year. If you are interested in reading Four Dead Queens I will have a giveaway up on my Instagram page soon. Nah, I really don’t think you would. Definitely overhyped.